You are currently browsing the The Pet Product Guru blog archives for the day Tuesday, March 20th, 2018. Cats Either Love To Be Brushed or Hate it! Cats can be very difficult when it comes to grooming. If you’re lucky enough to have a cat who actually likes to be brushed, then great. My cat Millie loves to be brushed but on her terms. She expects to be brushed when I get out of the shower and she is there waiting every single day no matter what time it is. If your cat squirms, hisses, and runs away every time you take out the brush, then maybe this tip will help. Try giving your cat a toy that will occupy him while you brush. If he likes catnip, that may even be more enticing for him. He will concentrate on biting the cat toy with catnip rather than you. He may also stay put while you groom him. If they love being brushed, they will expect it all the time like my cat Millie. 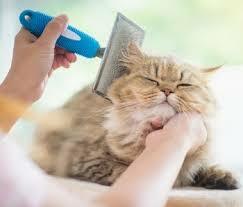 Cats should be brushed regularly and it doesn’t matter whether it’s a long hair or short hair. Listen to our online radio station here on Delmarva. Edgewater Gold Radio plays all of your favorites —oldies from the 50s 60s 70s 80s and popular standards. Edgewater Gold Radio —all oldies all the time–your go to oldies station! add comment Comments Off on Cats Either Love To Be Brushed or Hate it!